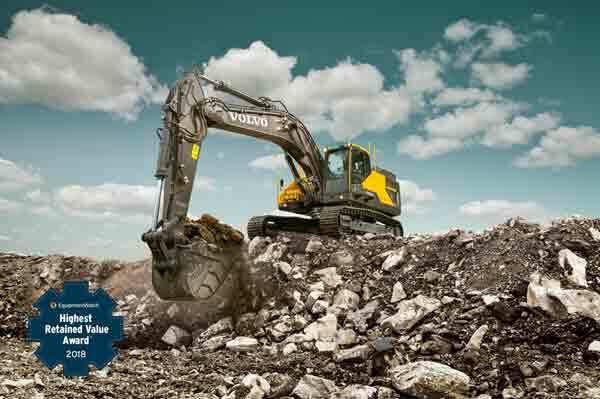 -Volvo Construction Equipment’s commitment to lifecycle value earns coveted industry awards. -More than 12,000 models were considered before naming the EC380E and L90 award winners. Industry business intelligence authority, EquipmentWatch, has chosen Volvo Construction Equipment (Volvo CE) for two of its 2018 Highest Retained Value Awards. The EC380E excavator and L90 wheel loader both received awards, reflecting Volvo CE’s commitment to attaining the highest lifecycle values in the industry. The milestone marks the third straight year that EquipmentWatch has recognized Volvo CE with awards. EquipmentWatch analysts considered more than 12,000 models with up to 20 model years of values for the third-annual awards, announced in conjunction with World of Concrete 2018 in Las Vegas, Nevada. Volvo CE’s machines were chosen for their projected value retention over a five-year period. Volvo CE’s EC380E excavator won in the Medium Crawler Excavator size class (21.1 – 50.0 metric ton). In the Medium Wheel Loader category (135 – 249 hp), the Volvo CE L90 surpassed the competition to take home a prize. Both machines have displayed exceptional residual value, with the highest average ages on the market.